Can you spot Mina resting beneath the roof on the monster 230-foot 5.13d route Totally Free II? Photo by David Mason. The science of training, nutrition, psychology and tactics has crept into climbing. Gone are the days when climbing performance was simple, there are a plethora of terms to grasp now: do you work on your aerobic capacity or your anaerobic power? Is your limiting factor your isometric finger strength or your mental game? What’s this ketogenic diet about and can you really pull hard without a good dose of carbohydrates in your belly? Increasingly we see evidence of a movement to analyze, to set goals, to construct plans and strategies. To perform at your top level you can’t turn up unprepared; in today’s climbing world that just wouldn’t cut it. So what does preparation look like? It comes in many forms from athletic competence to mental strength, from a well-timed ”peak” to a balance between training and rest. These aforementioned skills are all grafted out in the weeks, months and years before a climb, but what can we do to get that extra 2% on the day? Last month my vital last minute preparation came in the surprise form of strawberry flavor, pencil-shaped sweets. Mina on Totally Free II. Photo by Keith Sharples. 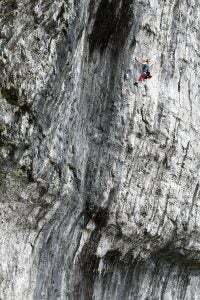 Rewind a couple of days and you’d see me pumped out of my brains 226 feet up a 230-foot single pitch sport route. I’d been on the route for an hour and was seriously hitting a wall. The rope drag by that point was epic and I couldn’t clip. I was on big holds trying to shake out and recover…the good aerobic capacity I thought I had cultivated decided not to show up to the party, or at least not to stay long. My legs were shaking—you know, the sewing machine dance. 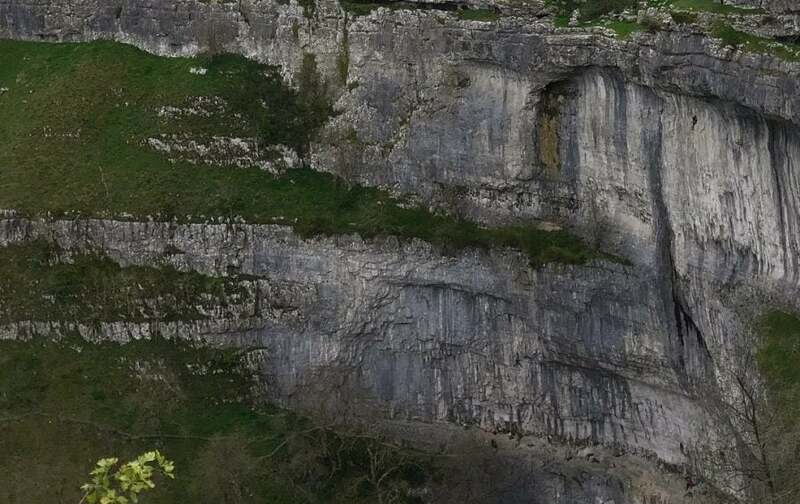 Only a couple of moves remained before I could mantle the crag and top out the iconic route of Totally Free II (8b/5.13d) that climbs the entire length of Malham Cove, (Yorkshire, U.K.) in one pitch. But my body said no, not this time. I pushed on past the clip, elbows by my ears, one last-ditch effort before I was falling through the air. Exhausted and depleted, I looked to analyze. What went wrong up there? How could I affect change in that situation? Something was missing from my strategy. Mina’s secret weapon: Strawberry pencil sweets. Performance nutrition for me has always looked wholesome. It’s been a frighteningly British middle-class journey of salmon and quinoa, kale and broccoli, single origin coffee, chia seeds, boiled eggs, avocados and homemade “healthy” snacks. My fridge is like a patchwork of health food adverts; the macros in my meals are planned and tailored to meet a specific demand. But that day I had needed more than well-timed whole grains and oily fish could offer. I needed extra energy up there and I needed it fast. I was ready to try a new tactic. Going to the sweets aisle in the supermarket felt like an exhilarating trip to the dark side: this was not my normal habitat. It was bright and sickeningly colorful, the options were endless. Fizzy, fruity, chewy; I was out of my comfort zone. The flavors were alien to me so I picked at random: strawberry pencil sweets (a distant British relative of the Twizzler). I read the ingredients list … all the bad sounding things. Perfectly luminous and flamboyant, I took them to the checkout. Fast-forward a day and I was back at the crag, standing at the foot of Totally Free II. Looking up it seemed a long way to the top but this time I had extra ammunition. I checked my knot; chalked my hands, signaled to my belayer that I was safe and ready to climb. It was time. To the casual observer, nothing had changed but I had a plan and it didn’t involve additional fuelling on the ground, that wasn’t enough last time. Oh no, this time I was taking my dark magic bullet up the route with me … I had strawberry pencil sweets tucked in my sports bra. Whenever there was a rest I reached down and took out a sweet or two. The sugar stops became like a series of punctuation marks, moments of weird juxtaposition between guzzling junk food and engaging with my physicality and the rock. I’ll admit I had a few giggles at the absurdity of what I was doing; this was the most novel use the upholstery of my upper half had ever offered. Mina sending the 230-foot Totally Free II with the aid of her strawberry pencil pick-me-ups. Photo by Keith Sharples. To cut a long redpoint story short, I snacked my way up the 230-foot route. I didn’t hit a wall. I didn’t get the shakes. Of course, this anecdote, my observational study with a single participant, does not signal cause and effect. 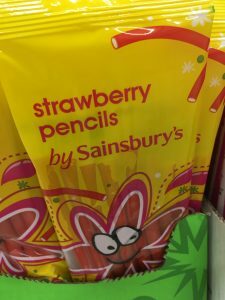 My beloved strawberry pencil pick-me-ups may have had nothing to do with the outcome but I like to think they played a role, and they’re likely to find their way onto my shopping list again. 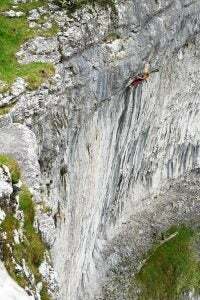 Smiling, I topped out, untied and dropped my rope to walk back down the crag, albeit with a bit of a stomachache. Love this! Thanks, Mina. Sometimes you gotta do the counter-intuitive thing, right? What made you think of going to the sweet aisle? Hi Julia! I’m not 100% sure actually….I am studying Nutrition at the moment and I think I was reading a paper on glucose absorption rates and carbohydrate use for athletes when the idea popped into my head. I have never really gone down the route of energy gels/shots before and I guess this was my cheaper (and more transportable) version of trying that out!